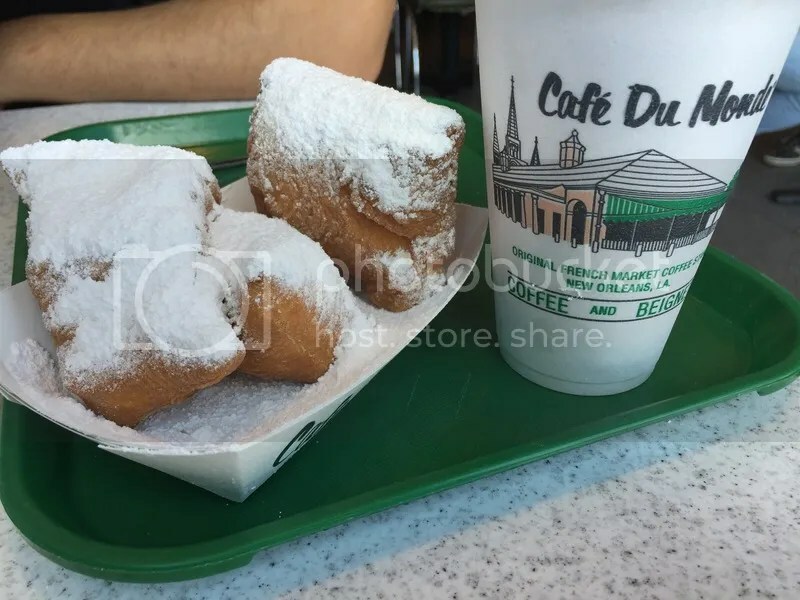 First things first, no trip to New Orleans is complete without eating beignets at the famous Cafe du Monde. They’re also known for their unique coffee blended with chicory. Get it “Au Lait” (mixed with hot milk) or a frozen slushie version like I did, because it was HOT out! 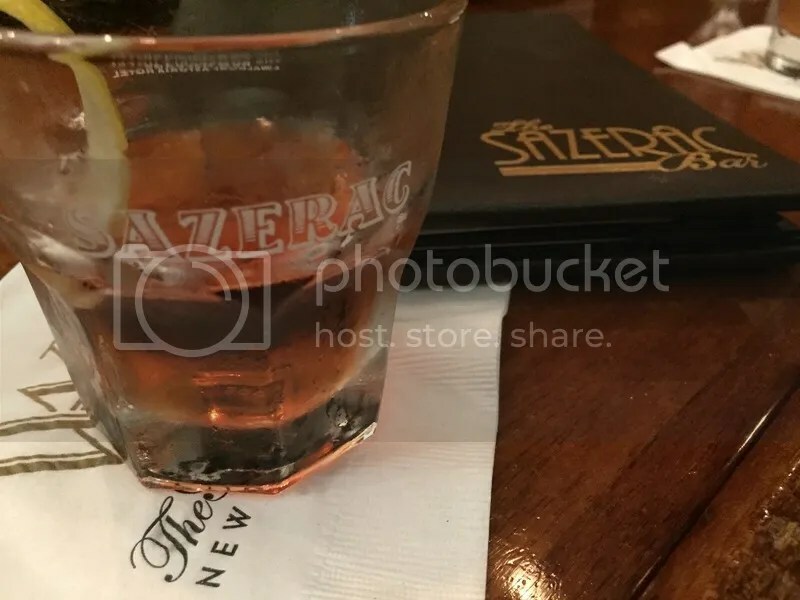 The heat was leaving us quite thirsty, and since New Orleans is the birthplace of many of our “classic cocktails”, we decided to check out the Sazerac Bar in the Roosevelt Hotel. 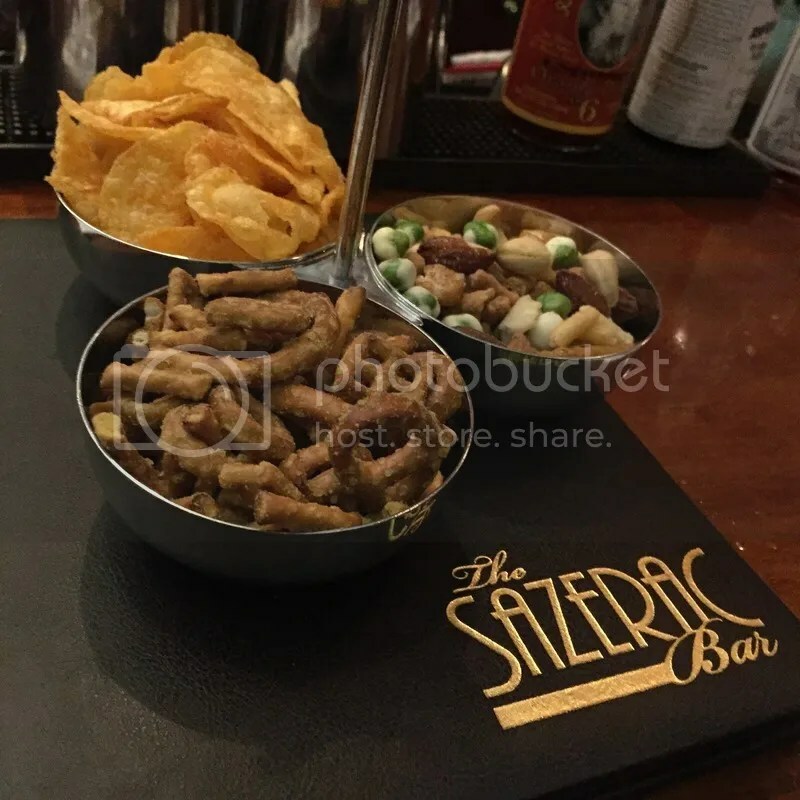 We got some bar snacks & ordered the namesake drink – Sazerac – made with Rye whiskey, Peychaud’s bitters and herbsaint. 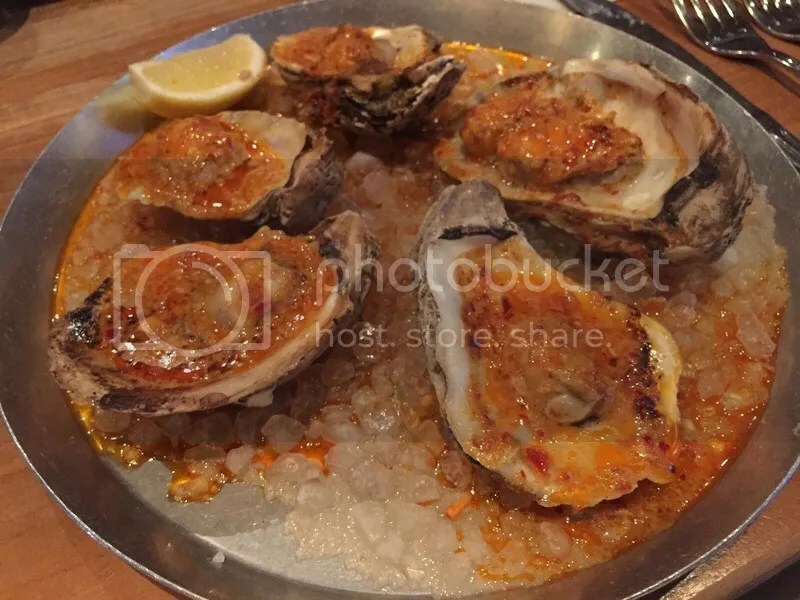 Oysters are another New Orleans staple. Raw, baked, grilled, charbroiled – doesn’t matter how you eat them, just as long as you do! We got some amazing wood-fired ones at Cochon. 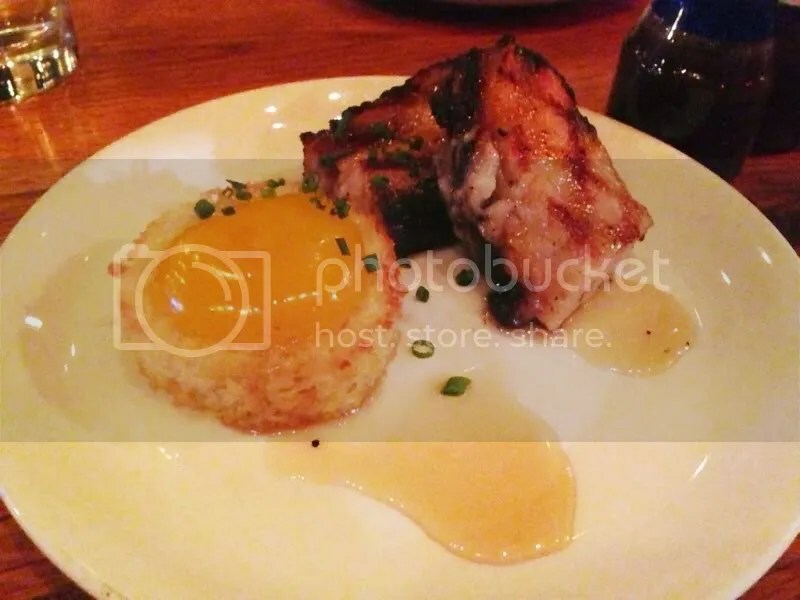 Don’t miss their signature pork dish, Louisiana Cochon. 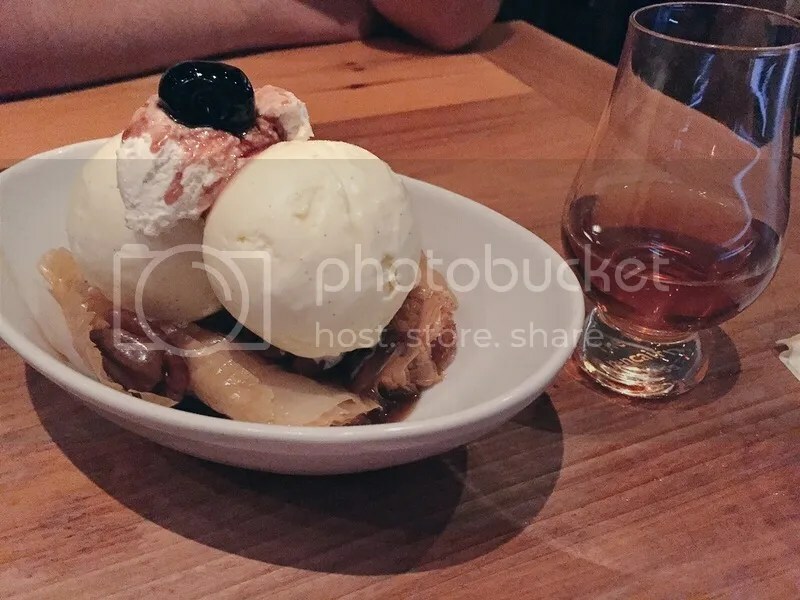 And make sure you save room for dessert – the fried banana split is to die for (which I paired with an excellent Black Maple Hill Rye from their extensive bourbon list)! New Orleans is also the birthplace to Bananas Foster, a dessert made from bananas & vanilla ice cream and a sauce made from butter, brown sugar, cinnamon, dark rum & banana liqueur. 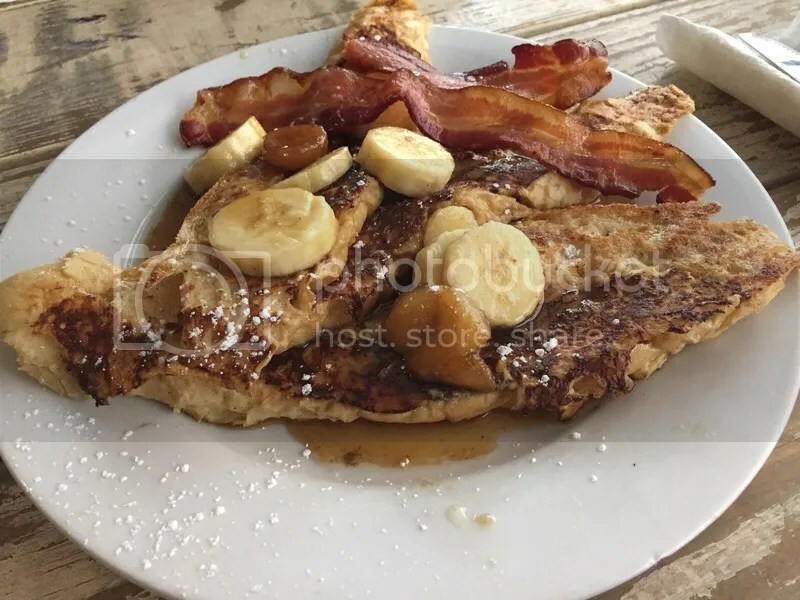 We popped into The Ruby Slipper for brunch and I ordered up some delicious Bananas Foster french toast. 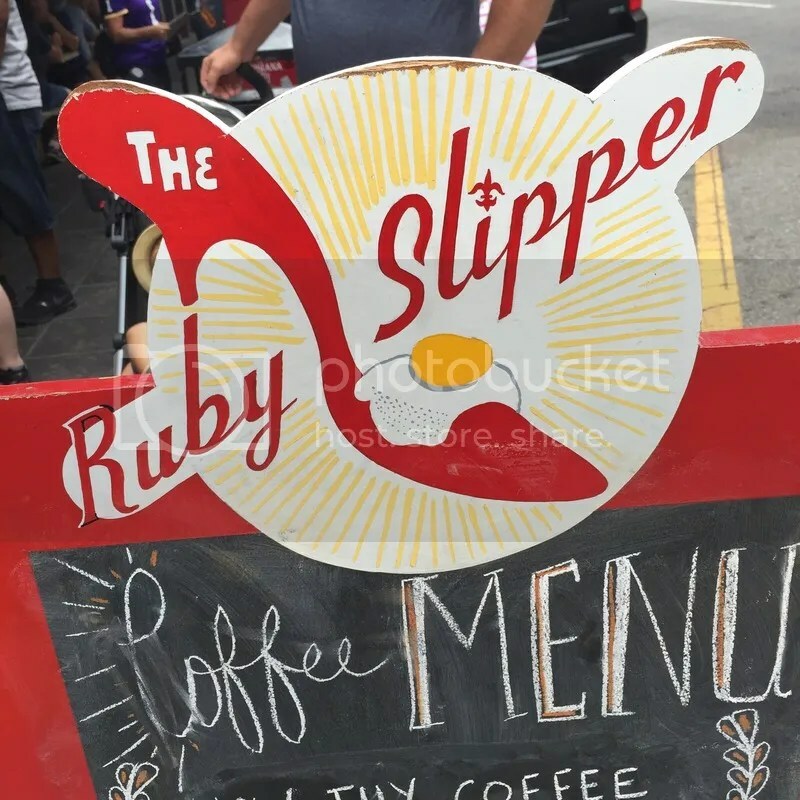 Inspired by the most famous ruby slipper wearer in history (because “There’s no place like home!”), the owners of the Ruby Slipper started the restaurant as a way to welcome back to the city all those who were displaced during Hurricane Katrina and to show their gratitude for their city. Of course, what kind of burger blogger would I be without testing out the local burger scene? The Company Burger is at the top of every NOLA’s best burger list so I went and checked it out. 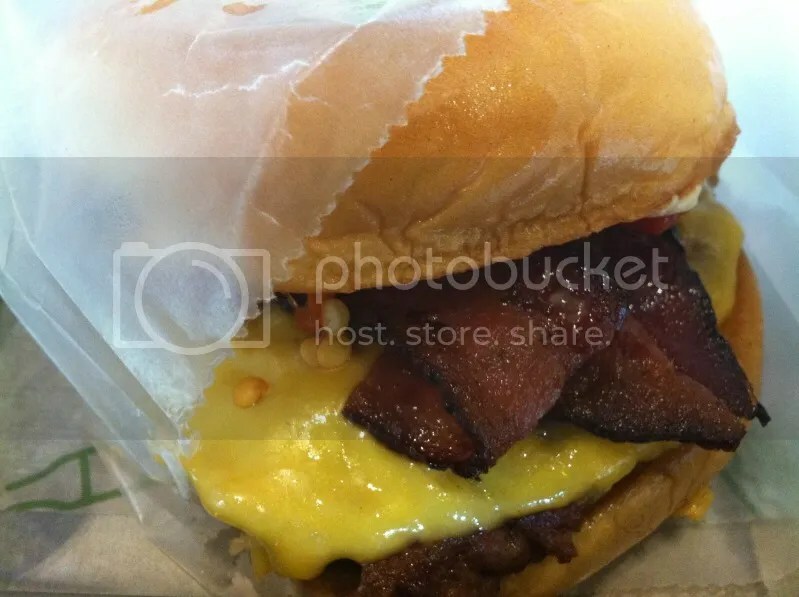 With a concept similar to Shake Shack, they also serve up hot dogs, milkshakes, beer and burgers. 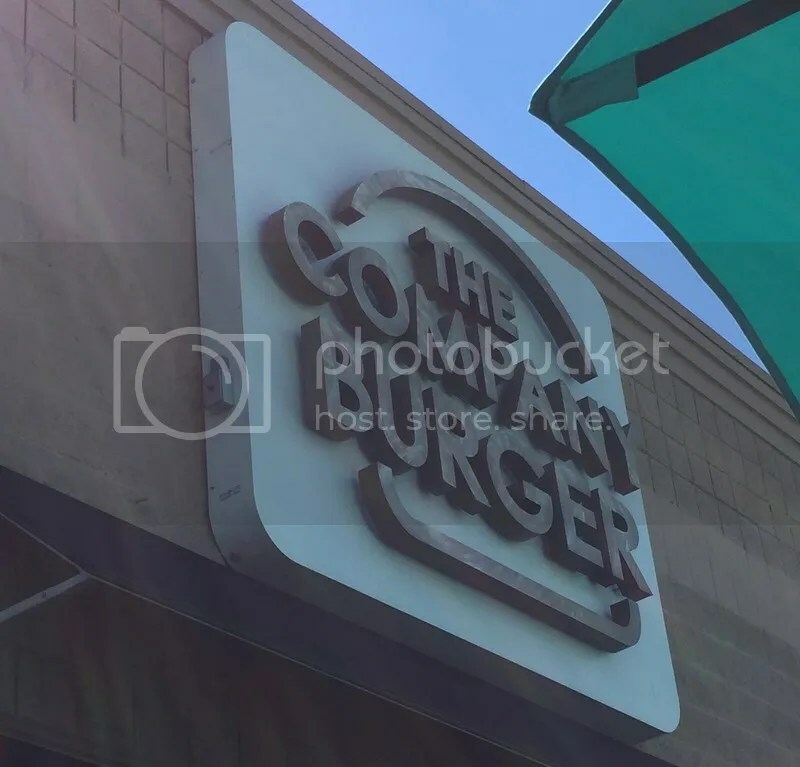 I opted for the namesake Company Burger: two patties cooked through topped with American cheese, housemade b&b pickles, and red onions on a toasted bun. I also got sweet potato fries and another Southern classic: pork rinds & pimento cheese. So my last meal entry might not exactly be associated with New Orleans, but it is a New Orleans staple. 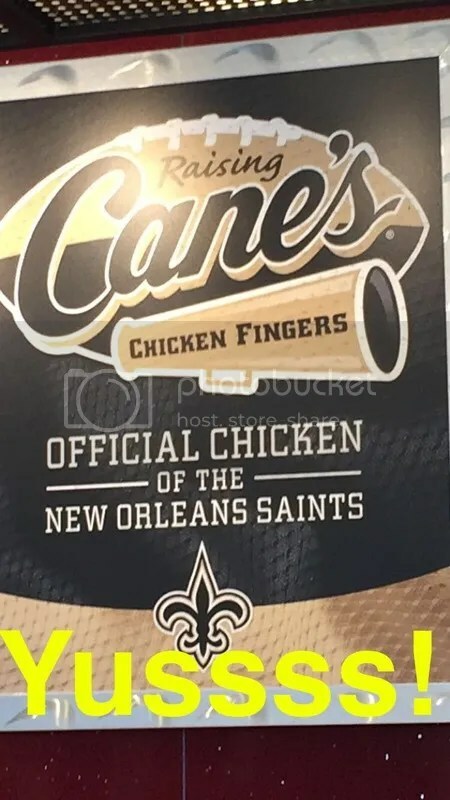 Raising Cane’s chicken fingers is the official chicken of the New Orleans Saints football team and since Sunday was a game day, we had to partake. 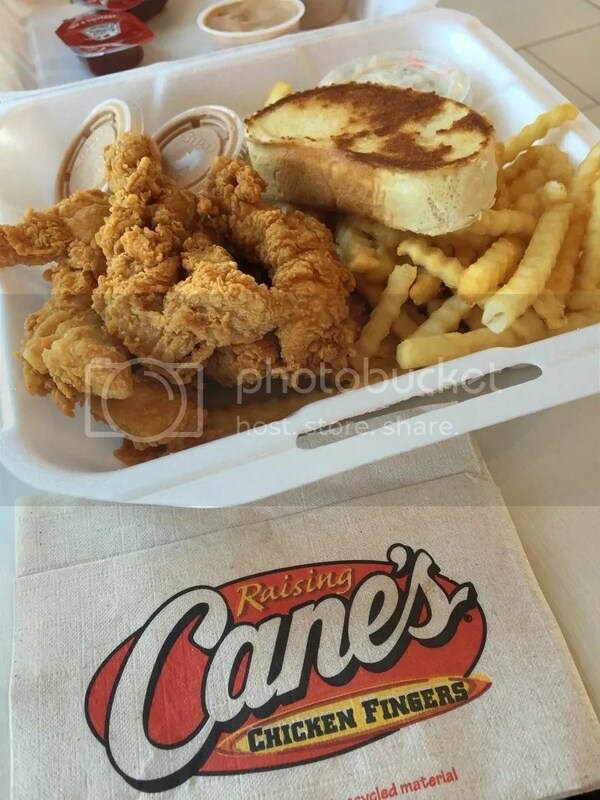 If you’re not familiar with Cane’s, it’s real simple: They serve fresh, never frozen chicken fingers, crinkle cut fries, coleslaw, texas toast and their own secret ingredient Cane sauce. We split a “Caniac” – a 6 piece box and honestly, I could have eaten a whole one myself. It’s just so good! 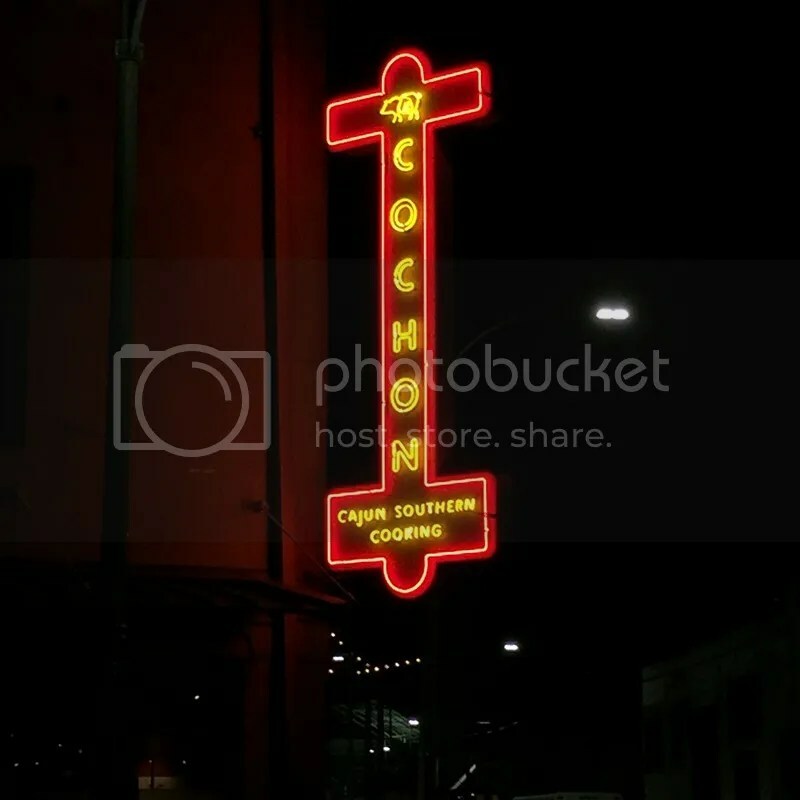 Posted in Bananas Foster, beignet, Cafe Du Monde, Cainiac, charbroiled oysters, chicken fingers, classic cocktails, Cochon, fried banana split, New Orleans, NOLA, oysters, pimento cheese, pork rinds, Raising Cane's, Roosevelt Hotel, Ruby Slipper, Sazerac, Sazerac Bar, The Company Burger. Bookmark the permalink. 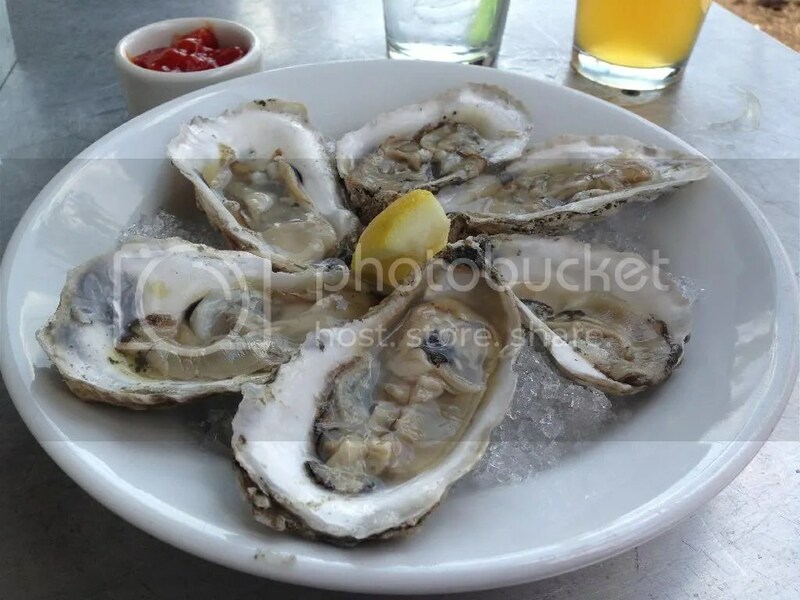 Oysters are one of my favorite treats on a warm, summer day when you don’t feel like eating something heavy. Oh, I know there’s that old stigma about not eating them during months without the letter “R” in them, but they’re just so light & fresh! 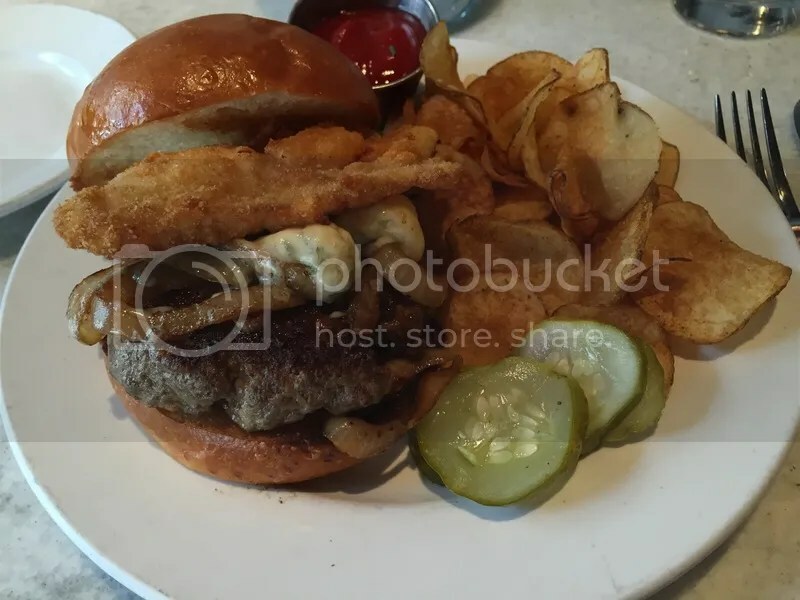 So imagine my surprise when I found out that Oyster House combines both my favs in one meal: I’m talking about the OH burger – a burger topped with a fried oyster! 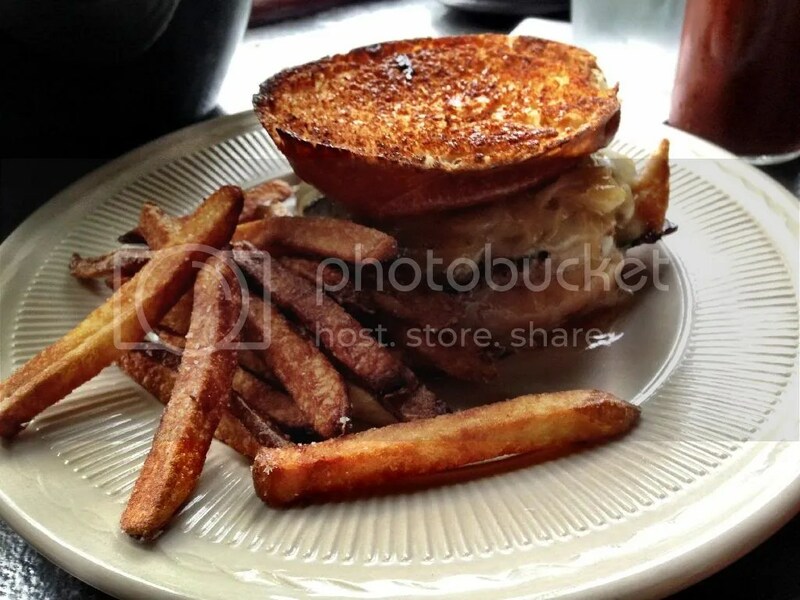 It also comes topped with blue cheese and grilled onions on a brioche bun. The burger came out perfectly cooked to medium as requested – it had been a while since I saw a nice, juicy pink center like that! The burger to bun ratio was good and I didn’t wind up with a soggy bottom. Unfortunately, it was kind of downhill after that. The fried oyster had way too much breading on it and was weighing down the top bun. Whenever I tried to take a bite, it would slip the top bun away from me! 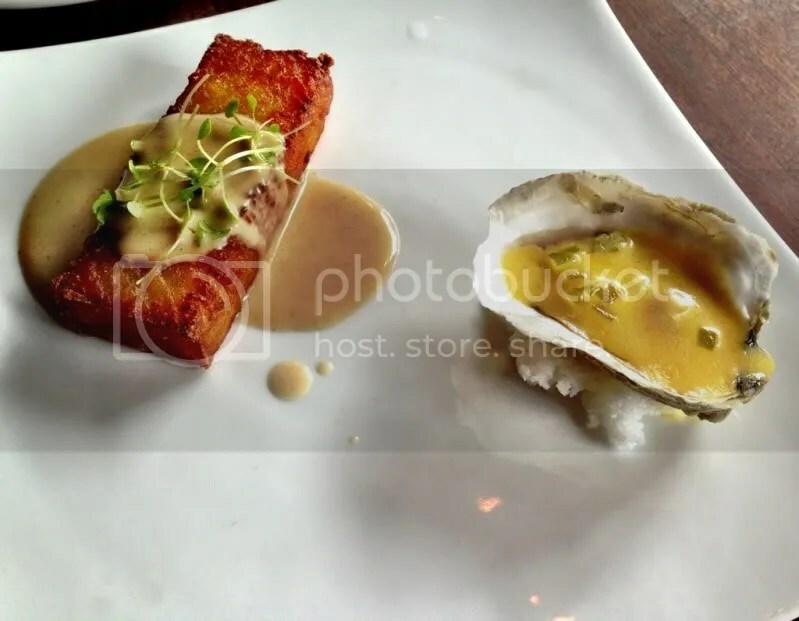 I also could barely taste the oyster over the breading. And the blue cheese was so salty and overpowering, I could barely taste anything else, either! 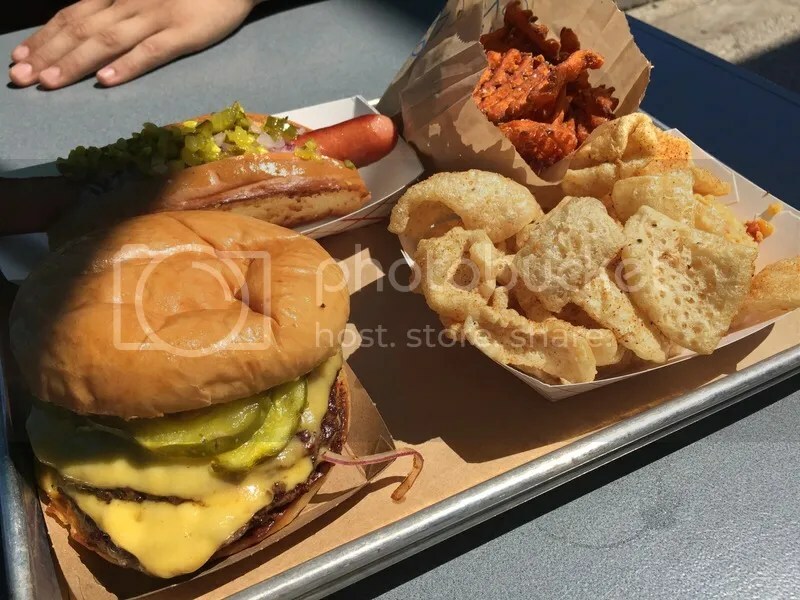 They were very sizable little blue cheese chunks, which I was able to scoop up with some of the chips, but with each bite of burger, nothing else filled my mouth except blue cheese flavor. It was really disappointing. A milder cheese would definitely have been better – as well as a light batter on the oyster. Sometimes the best of both worlds isn’t always what you hoped it would be. Next time, I’ll just stick to buck-a-shuck! Posted in blue cheese, brioche bun, burger, burgers, fried oyster, grilled onions, onions, oyster house, oysters, philly, pickles. Bookmark the permalink. Welcome all to our 100th post! In honor of this milestone, I bring you a little something I like to call “The Splatty Awards!”: recapping the best things I have been eating, drinking & doing for the past year or so. Briefly removed from their winter menu for a few weeks in December (in which I cried into my pillow every night), the Tomato Conserva is back in action! 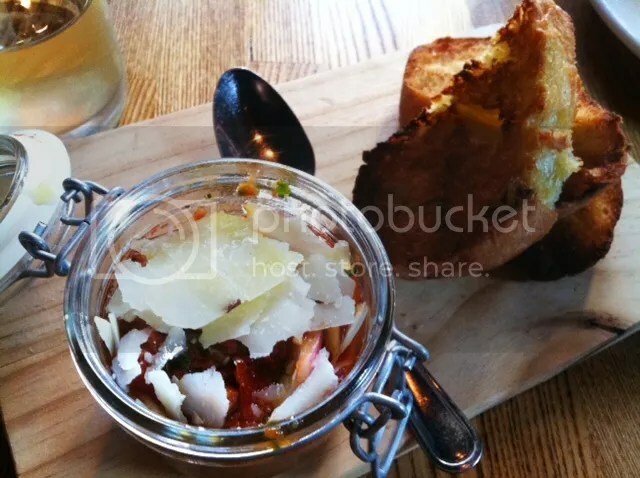 This sweet bruschetta will have you licking the jar clean & begging for more! Danny Meyer’s fast-casual burger joint quickly gained a fandom on Sansom Street in the summer of 2012, and expanded this year with outposts in University City & King of Prussia. The Smoke Shack was initially conceived for the Philadelphia location, but has expanded to all Shacks globally. Yeah, they’re slimy and salty and weird and jiggly, but they’re also delicious! I’ve been making it my mission to hit every buck a shuck & half price oyster night in town. When the LOS truck’s engine went kaput this fall, the team at Kennett lent them a hand – and their kitchen – for the evening to raise money for a new one. And maybe I’m a little bit biased because it was my suggestion to turn out patty melts; a once in a blue moon burger special they were serving up on East Passyunk last spring. I’ve been partaking in Opening Tap for the past two years now, and seriously, if you’re not making this a priority during PBW, you’re missing out. Opening Tap showcases the best and brightest of the local Philadelphia beer scene under one roof (the Independence Visitors Center, to be exact). But remember, it’s a marathon – not a sprint! 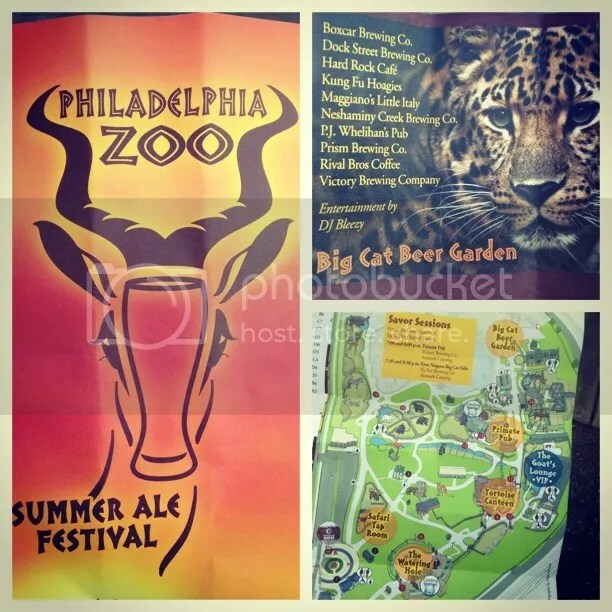 Great Beer + Local Food + Adorable Animals = One of the most awesome times you will ever have. Don’t forget to take a selfie of yourself “drinking a beer” with a tiger! Most of the animals are actually awake compared to a day trip, and zoo docents are on hand to provide detailed information on your favorite critters. Sampan gets the advantage as they have happy hour 7 days a week from 4-7 PM, but Alla Spina offers some great bar bites and their Victory Brewing beer collab, Novello, for only $3! 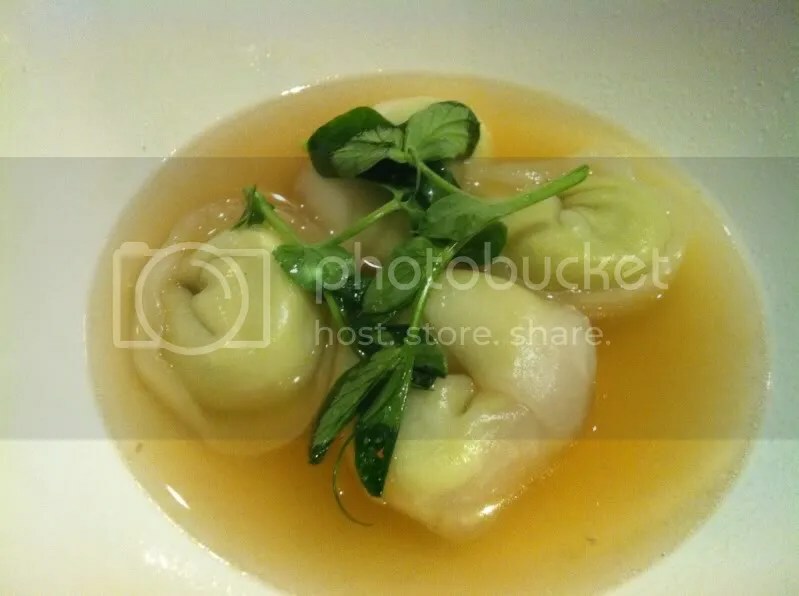 Don’t miss Sampan’s edamame dumplings or the pretzel bites with beer cheese at Alla Spina (they come in an adorable wooden piggy)! The Brunch crowd mourned the loss of Cafe Estelle for many months, but Marshall Green’s famous & delicious sticky buns have finally found a new home in Northern Liberties. I hated Bloody Marys until I tried the one at Jerry’s and now I’m hooked. 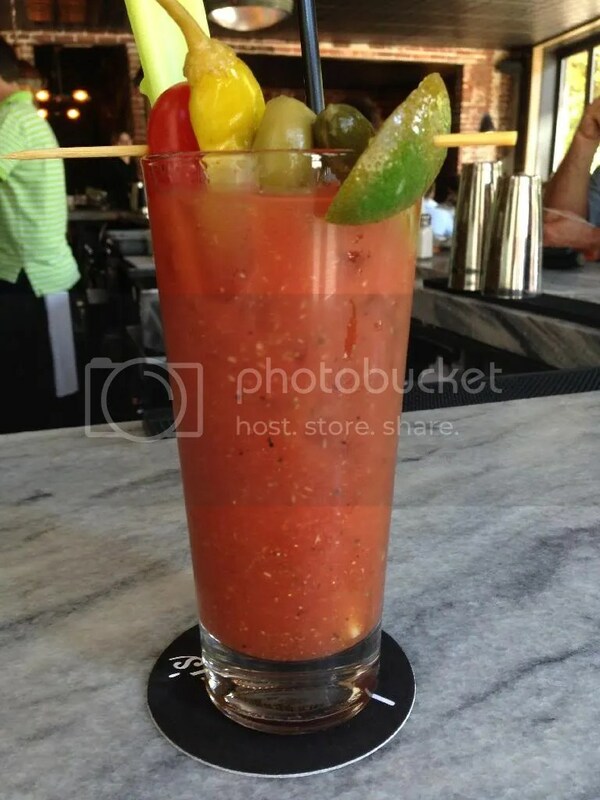 Seriously – best Bloody Mary ever! 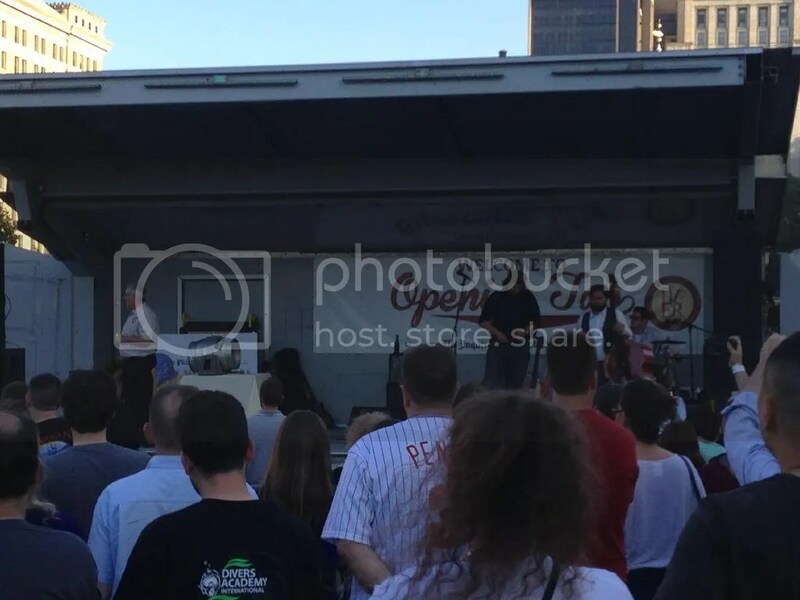 “But isn’t Spot Burger a food truck?”, you’re probably asking yourself. Well, who says a restaurant needs to be defined by four brick walls? SpOt Owner/Grillmaster Josh Kim is the hardest working man in these streets right now, and he proves it on a weekly basis with his innovative specials (like a $10 Lobster Roll this summer), as well as his philanthropic efforts. He supports dozens of college organizations and local charities, frequently running specials and donating portions of his proceeds to these causes. He’s been a champion for food truck rights in Philadelphia, residing on the board of the Philly Mobile Food Association, and turned the corner of 33rd and Arch St into the “Food Truck Mecca”. So next time you see his yellow cart around, grab some grub; you won’t be disappointed! Spot serves up one of the best burgers in town. And that concludes our awards ceremony! I hope you’ll at least check out some of the places and foods I love, in addition to the delicious burgers I recap for you guys each week. Got any great places and foods you think I should try? Post em up in the comments section and maybe they’ll wind up on my “best of” list next year! Posted in alla spina, beer, bloody mary, brunch, delicious, dumplings, eats, food, food trucks, happy hour, in riva, Jerry's Bar, lobster roll, LOS, Lucky Old Souls, nyc, Opening Tap, oysters, Patty melt, philly, philly beer week, Pop-Up, Sampan, shake shack, smoke shack, spot burger, Summer Ale Fest, Zoo. Bookmark the permalink. Last night I was invited to the Four Roses Whiskey Tasting at Percy Street Barbeque, which also doubled as an unveiling of their delicious new menu items. While the menu had been primarily focused on Texas style BBQ, a lot of other competition in the BBQ arena has started to pop up around Philly (Most notably Stephen Starr’s Fette Sau). Looking to stay ahead of the curve, Chef Erin O’Shea has spiced up a bunch of Southern favorites while still keeping your tummy happy with delicious smoked meats. 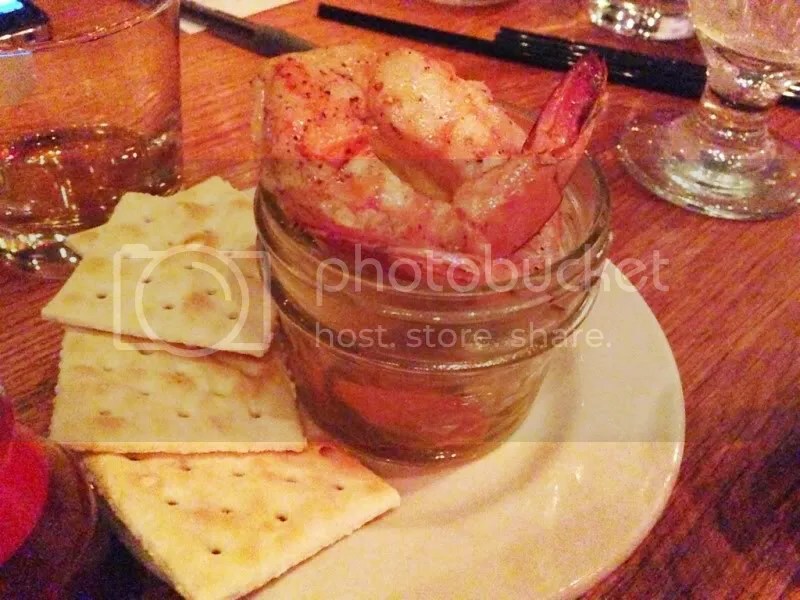 Poached shrimp with spicy pickled vegetables, beer vinegar, saltines. Just think of it as a Hillbilly shrimp cocktail! 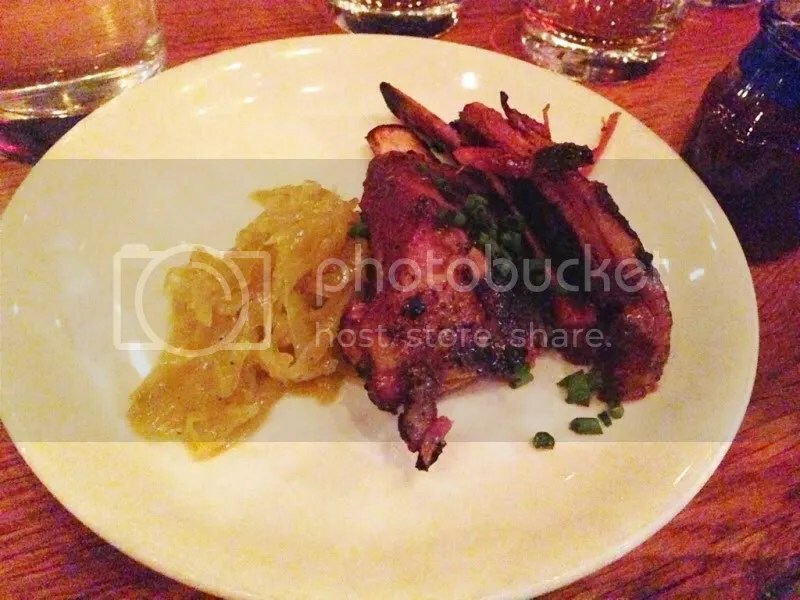 Lamb ribs with braised sauerkraut and apples; so tender & falling off the bone. Pork Belly with house made potato bread, cured egg yolk, maple syrup; I could eat this for breakfast, lunch and dinner! 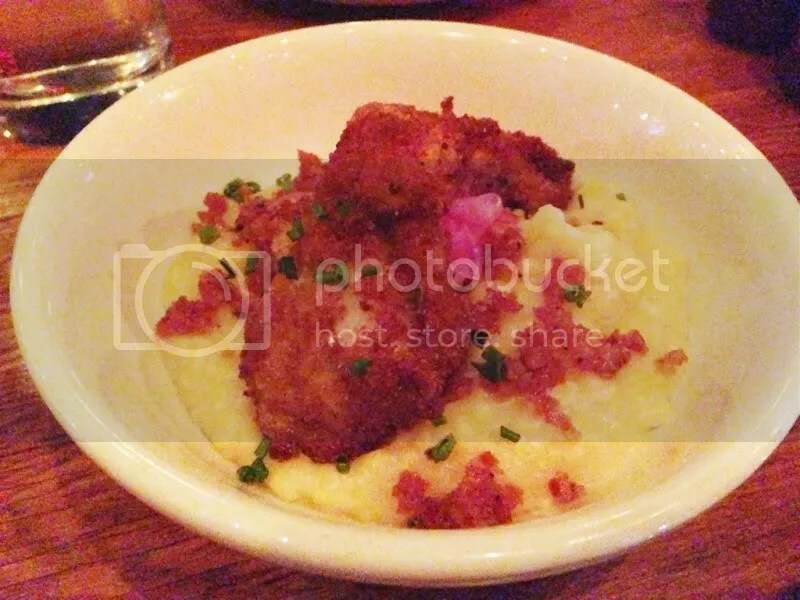 Fried Virginia oysters with sausage and grits; The oyster was so light and moist considering it was fried. This was probably my favorite of the starter dishes. 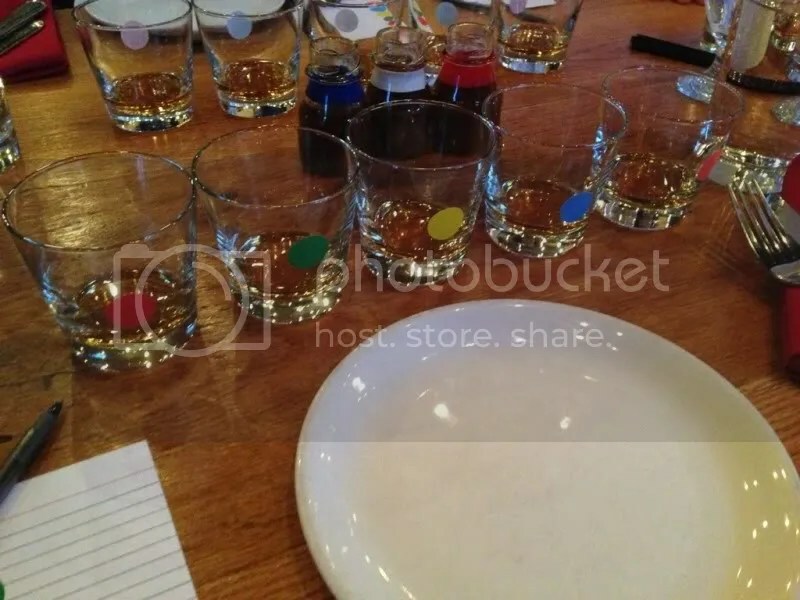 Meanwhile, we were busy blind sampling five different bourbons from Four Roses’ lineup. We learned that Four Roses uses 5 proprietary yeast strains with two separate mashbills to produce 10 different bourbon blends, each with their own unique character, spiciness, and rich fruity flavors. Each of these bourbons are aged in different distilleries throughout Kentucky, and depending on temperature, evaporation and other environmental factors , each bourbon has a different taste. We were asked to rate each of the 5 samples from 1 (being our least favorite) to 5 (most favorite), and at the end our results were tallied and that would determine which barrel Percy Street will be using this upcoming season. I’ve been spending a lot of time with the Philadelphia Whiskey Society, so I’ve gotten used to tasting different whiskeys and adapting my palate. We were first asked to take a drop from each whiskey and rub it in our palms to heat it up, and then smell our palms to detect the different fragrances in the whiskey. Then, nose the whiskey with your mouth slightly open to pick up more of the aromas (kind of the way snakes use their tongues to smell, right?). Finally, the sipping! With your tongue pressed slightly behind the back of your bottom teeth, letting the liquid slide into the middle of your tongue to get a good “mouth feel”; determining the burn or smoothness, texture, floral or woody-ness, etc. and letting it coat your tongue thoroughly as it works its way though all your flavor receptors. After sampling a bit of each whiskey, I then added a few drops of water to see how it would open the bourbons up. Some of them improved slightly, but for others, not even water could change my mind. I went with the whiskey in the Green dotted glass, which turned out to be the overall winner. I twas just very smooth and sweet and there wasn’t a lot of burn afterward (Percy Street will be revealing the exact name of the bourbon and its distillery location this week, with the barrel arrive in 4-6weeks). 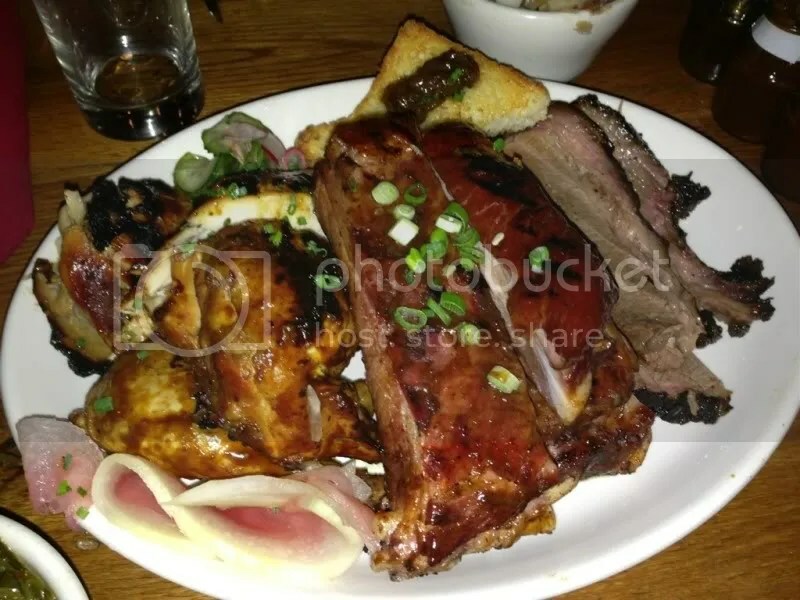 Just when I thought everything was said and done, each of our tables was delivered Percy Street’s epic meat tray; The Lockhart – several slabs of brisket, half a chicken and a handful of ribs, along with five sides. Holy cow (and pig)! 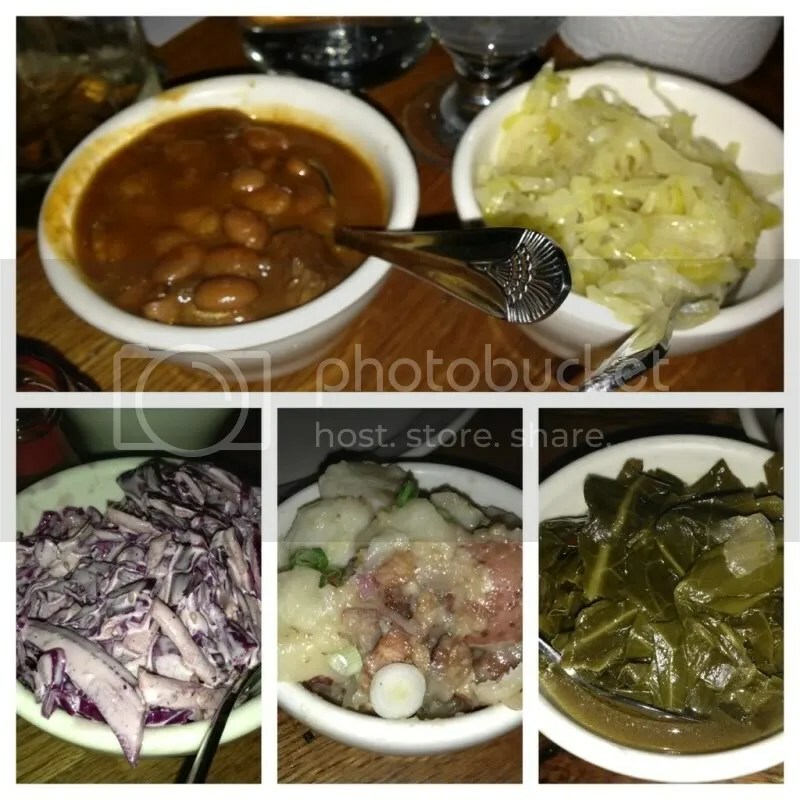 Baked beans, sauerkraut, housemade coleslaw, German potato salad and collard greens: yum! After all those amazing appetizers, I wasn’t even sure if I had room to eat any of it, but I took a chicken leg, a small rib, some brisket, all the sides and went to town. There were six people at our table and we received three Lockhart trays between us. We were a table full of ladies and could easily have probably just shared one or two between the group; there was so much food left over! (Although I did look around at the Men’s tables and their plates were pretty much licked clean, lol) I’m pretty sure I left in a meat coma and woke up this morning smelling like BBQ, but it was so damn delicious. 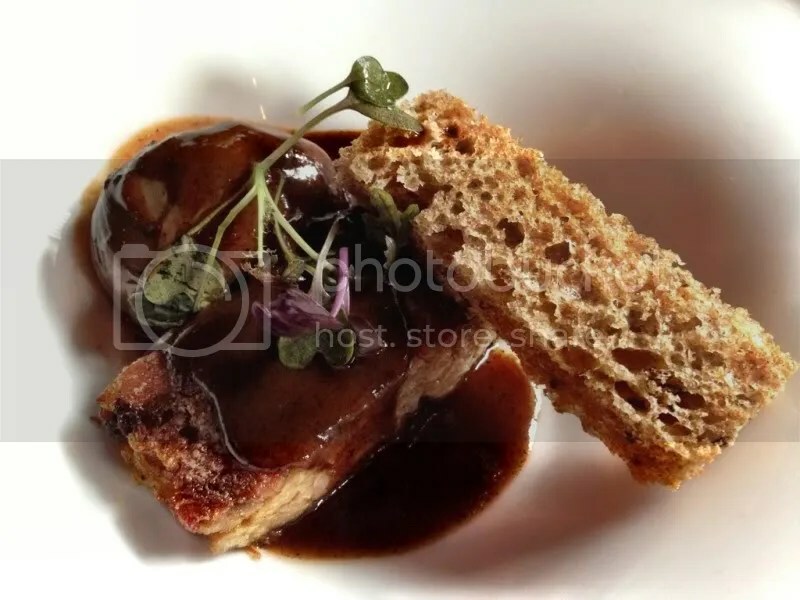 I definitely can’t wait to get back over there to try more of the pork belly, grits and of course, our specially selected Four Roses bourbon. Keep your eyes on their Twitter feed for the whiskey name and its arrival at the restaurant! Posted in bbq, bourbon, egg, Four Roses, fried, grits, oysters, percy street, philly, pickles, pork belly, whiskey. Bookmark the permalink. First up: A pancake with syrup shot, a whiskey and OJ starter shot with maple syrup. I didn’t find it too be too sweet, but some of my dining companions found it to be too sweet to drink all at once. I’d never had oysters before, so I was nervous for the next dish. I’m really weird about giggly, slimy consistencies in food; they make my skin crawl. But the oyster was a lot better than I expected. It wasn’t slimy at all and had an almost hollandaise-like sauce on it. I enjoyed it so much that I ate someone else’s oyster because they didn’t want it! 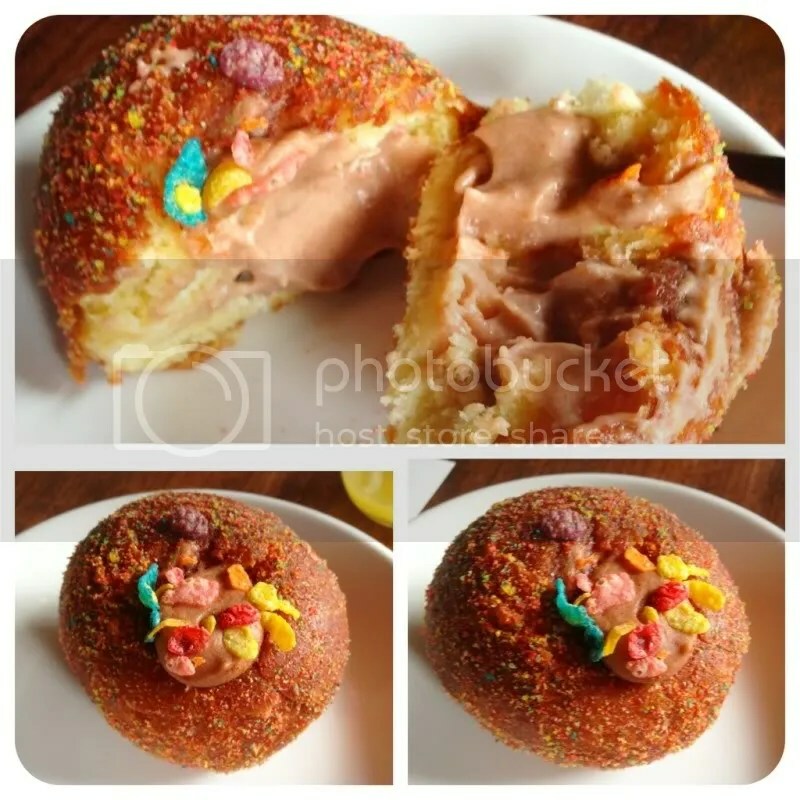 This was paired with a hashbrown drizzled with bone marrow gravy and now I may never want to eat a McDonald’s hashbrown ever again (unless I’m really hungover). On the more savory side, the next dish was coffee-coddled eggs with duck hash. Piercing the egg and mixing the yolk in with the duck made for an amazing flavor combination that was only heightened by the coffee infusion. Now this would definitely be the perfect hangover food! It also came with a little bit of bread to sop of the extra yolk and coffee gravy. I finished this before everyone else at the table, so clearly I hated it. 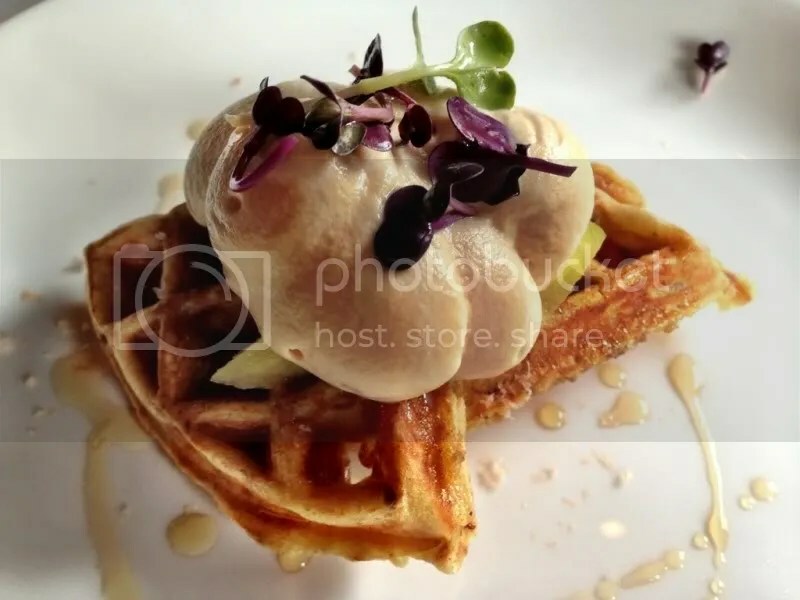 Last, but certainly not least, the piece de resistance, the reason we were all here in the first place: sausage waffles with foie gras whipped cream and smoked maple-whiskey syrup. They were delicious, fluffy and decadent. It was almost like the Willy Wonka Everlasting Gobstopper of breakfast foods: First you tasted the sausage, then the waffle, then the whiskey, then the foie, then the maple, back to the whiskey, and then you were practically licking the plate clean. I was glad they only gave us half a waffle because I don’t think I could have managed a full portion of this without having to take a break and do some light cardio in between. We all agreed once we finished eating and spending another 45 minutes digesting – both physically and mentally – that the best part about this brunch was that you didn’t have to choose between any of your favorite aspects of brunch. Normally you have to pick one dish: Sweet (waffles, pancakes), Savory (eggs benedict, omelets), or salty (sandwich and fries) – but this brunch had a little something from every category. All the portions were just enough and every course was spaced out with plenty of time for you to get psyched for the next dish. 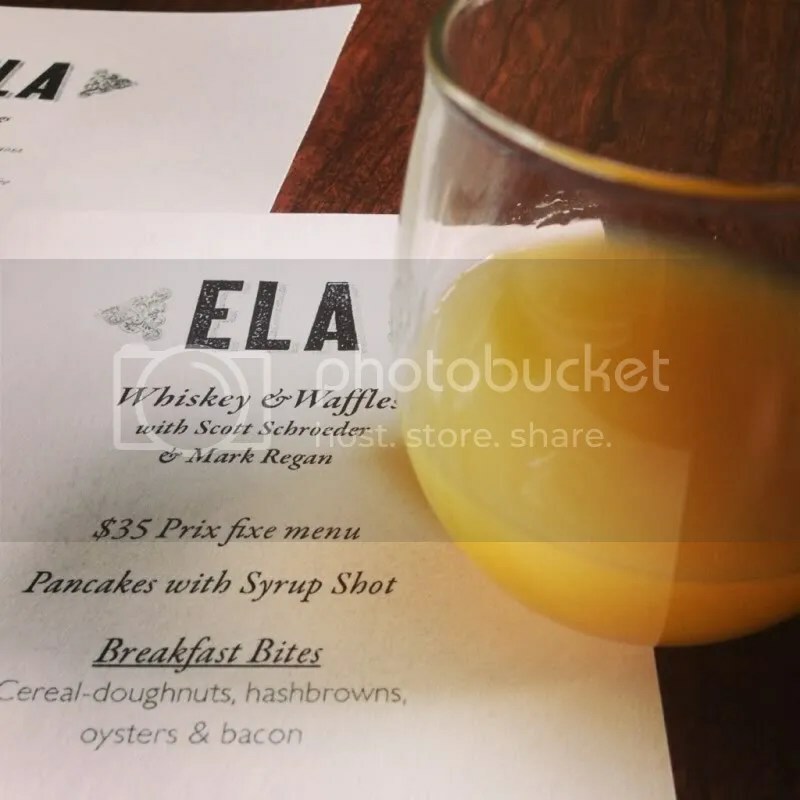 The Ela/SPTR crew is hoping to make Whiskey & Waffles an annual St Patrick’s Day weekend tradition, so if you missed it this year, make sure you mark your calendar now to get a spot in 2014! 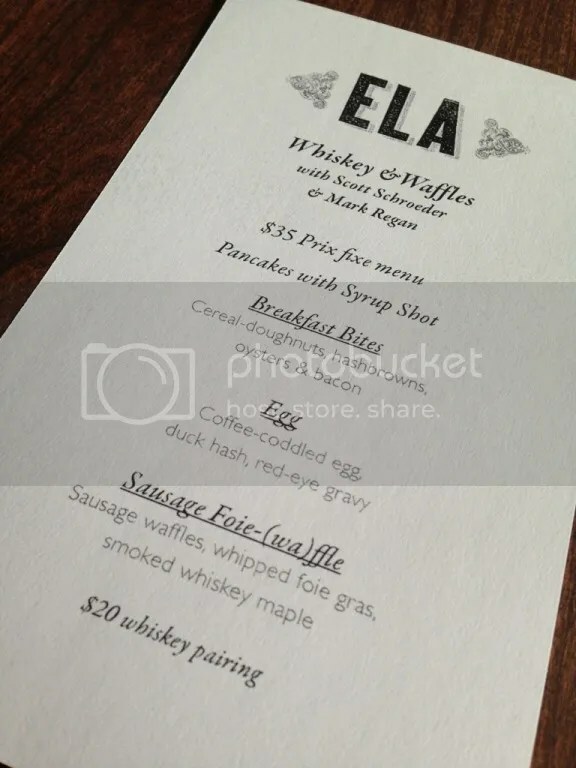 Posted in bloody marys, brunch, cereal, donuts, doughnut, egg, eggs, ela, foie gras, hashbrown, oysters, truffle, waffle, waffles, whiskey. Bookmark the permalink.